Inspired by a question from a South Australian client about whether March was too late in the season for snowshoeing I thought I’d give an idea about why March is actually a pretty good time of the year for snowshoeing and ski touring. And why the best time might even be later if you are going to higher altitudes or latitudes. 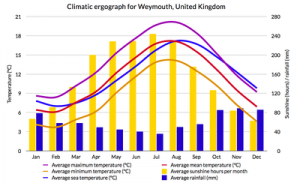 If you live in the mid-latitudes in a relatively oceanic climate regime (the UK or Western Europe for example, or West Coast America/Canada) then you are probably used to the seasonal lag – the fact that the longest and shortest days of the year (21 June and 21 Dec), when you’d expect it to be hottest or coldest, don’t actually collide with the warmest and coldest times of the year. They come a bit later. 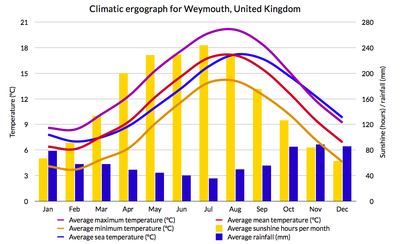 So August and February tend to be the extremes of both seasons rather than late June and late December. This is because the ocean has such huge thermal mass, so it essentially soaks up heat when there is the most sun, delaying the warming, and then gives that heat back out over time, delaying the cooling in the cold season. This moderates both the day/night temperature differences in places close to the ocean, and also the seasonal temperatures. Temperature extremes are much greater in the middle of the desert or in very continental climates. This is most obvious to us on a seasonal basis but actually also happens on longer time-scales (for example the oceans have taken up about 90% of the warming from greenhouse gases since 1955 (1,2) and water sinking deep into the oceans is now thought to be responsible for the pause in warming over the last 15 years (3)). A very small scale example is how long it takes to warm up a heater filled with water or oil opposed to a heater than simply blows hot air. The water heater takes longer to warm up but gives out heat over a longer period, even once the power is turned off. Quite simply, water is denser than air, so takes more energy to heat up, but then holds that energy longer too. In very continental climates, where the oceanic influence is much less, this is not the case (Mongolia or Siberia, Central Africa or Australia, central Canada/US), and the peak of the cold/warm season is much closer to the shortest/longest day, just as day night temperature differences are greater (4). On the eastern edges of continents (e.g., New York, Beijing, Shanghai) there is oceanic influence, but because the jet stream moves eastward (westerly winds come from the west and move eastward) these areas receive a significant amount of their weather from continental air masses (the freezing air that turns New England’s leaves fabulous colours, think west of the Great dividing range in Australia which often receives rain from over the Northern Territory (northern NSW and Qld) or up from the Great Australian Bight (southern NSW and Victoria)). These areas have less of a seasonal lag than the very oceanic climate regimes at the western edges of continents. What happens when you add snow and ice into the picture? If we add the cryosphere (snow and ice) into the equation this increases the lag again. 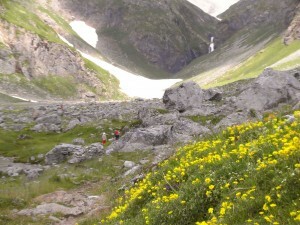 Who has not been surprised to visit the mountains and find snow in the middle of summer? Or even to have been surprised about how long a decent snowfall takes to melt. There are a number of reasons for this. Working from the Northern Hemisphere (as we are talking about snowshoeing and ski touring holidays in the Pyrenees and the Alps), in December when the days are shortest the ocean hasn’t cooled off completely from summer temperatures are sometimes warmer than they might be in February, when the days are longer. The ground has not completely cooled off and the first couple of snow falls might melt quickly from this warmth. Add to this the fact that dark ground absorbs more sunlight than light (snow covered) ground. So there is an initial lag in the system – until the ground is snow covered it is more difficult for the snow to stay. Once the ground is snow covered this both insulates any new snow fall from the possibly warm ground (snow is a great insulator, being full of trapped air), meaning it stays longer, but, and this is the most important effect, a white ground cools the atmosphere above it because sunlight is reflected straight back to space instead of being absorbed by the dark ground and re-radiated as heat. This cools the atmosphere as a whole, making it more likely to snow. Basically the more it snows the more it goes, and keeps snowing. Conversely, the more it melts, exposing dark ground, the more the atmosphere warms and the more it melts. This is called the ice-albedo feedback and is one of the most important feedbacks in the climate system. It is largely responsible for the ice age cycles. In the seasonal forecast for winter (see my blog post from November) early snow cover over Siberia is one of the key variables determining whether the winter as a whole will be cold. So February is the most likely time for snow to fall in Western Europe because the ground is cold, the ocean has cooled and there is good snow cover over much of the land (and Arctic Ocean sea ice has reformed). This has certainly been the case this year! But for snowshoeing and ski touring what you really want is for the snow that has fallen to be “transformed” which means melted a bit or consolidated, so that the avalanche risk is lowered. Making March the perfect time in the Pyrenees, and April the perfect time for higher Alps tours, and May probably best for places like Svalbard (Spitzbergen), because even though the days are lengthening, and lengthening even more dramatically the further north you go, the ocean is only warming slowly, and the ground is snow covered all around, so the lag is longer further north. 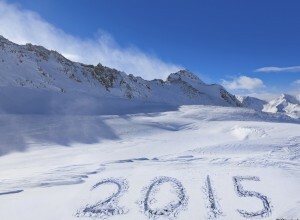 Snow in July: why do snow and ice take so long to melt? The end of this story is why it takes so long for the snow/ice to then melt. And this again has a couple of reasons. The first we have already seen – it is the ice-albedo feedback – basically the white surface reflects back most of the sunlight, so no heat gets in to warm things up and melt the snow. 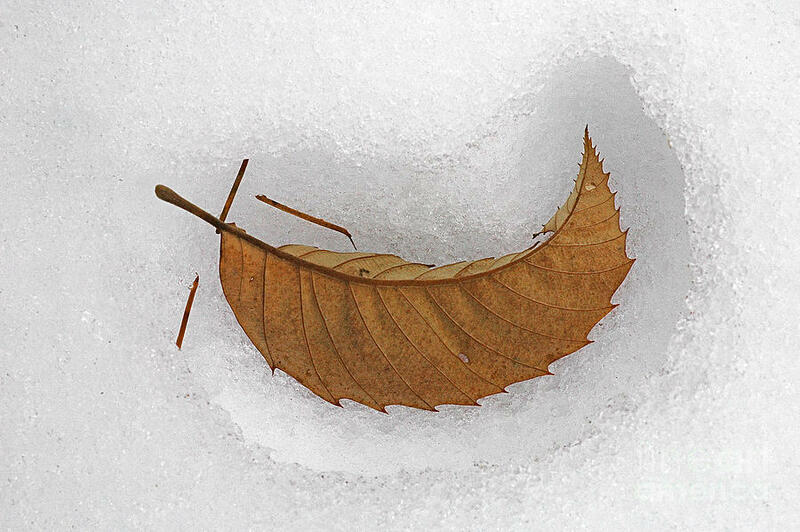 This can be easily seen if you look at a leaf that has fallen onto snowy ground. After a day or two of sunny weather there will be an indentation because the snow under the leaf has melted faster than the snow around it. This is simply because the leaf has a dark surface and absorbs more sunlight than the white snow around it. It heats up and melts the snow under it. The same is true of rocks so there is often a hole around a rock where all the snow has melted. The second reason is that the latent heat required to change water from solid to liquid or gas form is pretty big! So much of the sun’s energy is taken up just transforming ice at 0°C into water at 0°C. Temperatures will have trouble rising much when there is snow on the ground because all the heat is being taken up in the melting. So the seasonal lag is increased even more when there is snow or ice around, and you’ll find snow and ice in the Pyrenees even into late July, and some years into mid-August (and of course the glaciers remain year round). If you are hoping to trek in the highest areas of the Pyrenees or the Alps, August and September (less people and better temperatures) are the best times. June and July are perfect for pictures of flower covered meadows and snow capped mountains! Which still seems extraordinary when you consider June 21 is the day with the most sun. 1. Levitas et al., 2012: World ocean heat content and thermosteric sea level change (2-2000m), 1955-2010, Geophysical Research Letters, 39(10).